Our first speaker was a guy who “knows it all” (a quote from another colleague of ours), however, to be fair, we have more Zabbixers like him. We just cannot stop learning. And dancing… Vjacheslav speaks Latvian, Russian, Belorussian, English, C, PHP, security and UI. 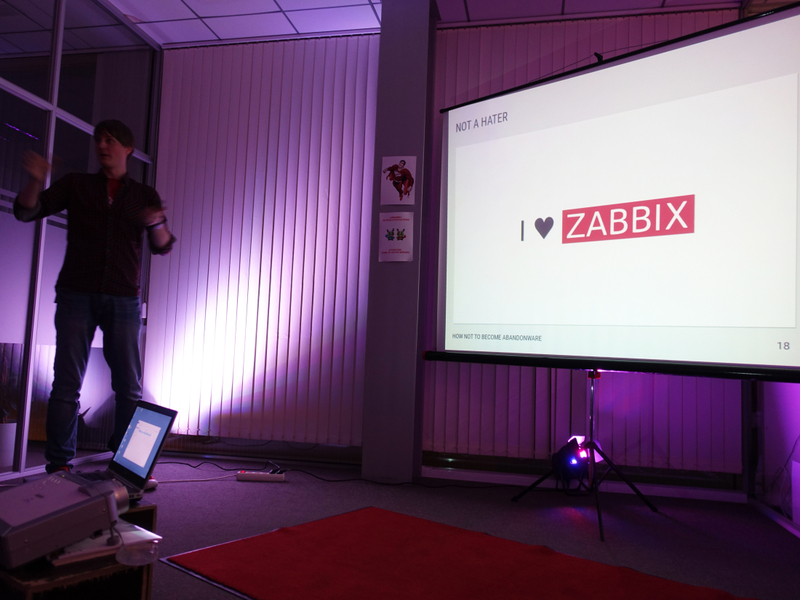 And he looooooves Zabbix! Yes, apart from developing a top-notch monitoring solution we also have a lab where we produce perfect colleagues, please join us and enjoy this version 3.4. Vjacheslav shared his experience on “How not to become abandonware” (in the minds of users while providing software updates) and how not to make your grandma scream when she sees an SQL error in a “I-thought-it’s-not-an-abandonware!” application (almost a true story from one of his Zabbix non-related projects). It turns out a fresh look is really important. Make some changes here and there, new logo, t-shirt, lipcolour and voilà! People feel not abandoned. Because taking care of yourself is the best way how to express your love for someone else. 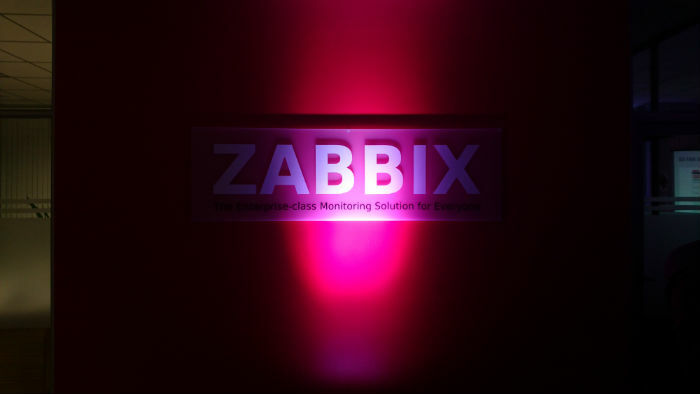 We discussed also several cases of Zabbix, how we prove that we are there for our users and what else we can do. Because we can and we will! UI, security, mobile support, TODOs to be fixed…Wishlist – check, work in progress – check, more ideas – check. 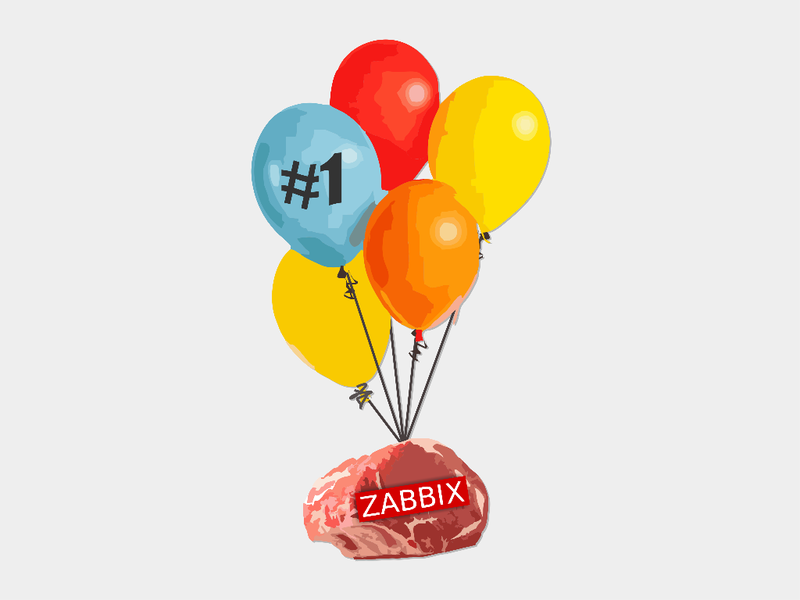 Sleep tight, Zabbix fans! 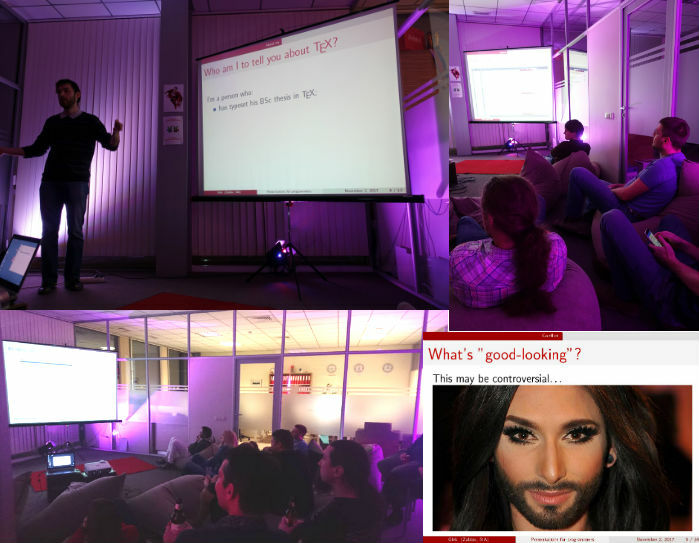 And here are some of Vjacheslav’s personal tips and tricks on the next topic presented by our colleague Gleb (“How to make a good-looking presentation if you are a programmer”). You may stop here and be totally content with your life or you may dig deeper and find out…that you need to dig more. This is where we finally found LaTeX (an immediate joyful thought of a cool mix of La La Land and Tex Mex burgers, that’s why many of us stayed till the end just to find out that it’s not. It’s better than that!). First of all, we tried to answer the oldest question in history – who am I? It took some time before we moved on to laziness being the cornerstone of evolution. Gleb admitted right away that he is a lazy-bones. As soon as we heard that in the job interview couple of years ago, we knew that Gleb was THE guy. Being lazy is the key to success and we want Zabbixers to be successful! Gleb created his presentation in 15 minutes and you wouldn’t tell judging by its complexity and pictures of well-groomed bearded women in it. Apparently both of these things made it look really professional and the audience kept asking zillion of questions (spot the bearded guy in the audience). By bringing up beautiful examples of “complicated” getting “easy”, Gleb is and will be one of the most valuable speakers also at our annual Zabbix conference (you can check out his speech, for example, here), so don’t miss out on his talks at the next Z Meetups! Happy, tired, and inspired – that’s what Z Meetup did to us. We have tons of other ideas and information to share, stay tuned, send in your ideas and requests, and be prepared for more! That is rapidly changing. Today there are grandmas trained in SQL and they might actually prefer to see details what went wrong to be able to fix it.